hope you like this, i would make you gifts individually but i just dont have time to wall often so you will have to stick with this, actually i couldnt decide to who to dedicate this when i started doing this wall and i always got you two in my head, so here ya go, i really hope you will like this ^^. i have two versions of this wall, one monochrome and one with original colors. Her pose is really elegant and delicate, the setting only adds to her beauty. This is a deadly amazing wall... just by looking at it you can tell how much work was put into it and how good the results are! but the lips could've been a bit lighter o-o, it's a bit weird for me to look at it so dark red @_@. I think about winter when I'm looking at this wallpaper, nice work. any chance of a widescreen version? i see you uploaded a wide-screen version on AP. perhaps linking to that wall would be helpful for those whom have wide-screen monitors. i just have a minor grievance with your wallpaper. strangely i have found that since i am not running windoze and have not a taskbar at the bottom; the long rambling signature actually detracts negatively from your wall. so much so, that i cannot use it as a wallpaper- which is sad as i enjoy it very much. in the future i humbly suggest just placing your appellation "YoruAngel866" to the bottom left. this would strengthen the wall tremendously. shizuka looks so pretty! 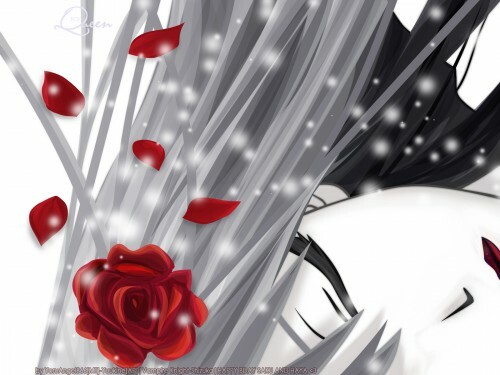 I totally love the rose & her hair xD everything looks perfect! I love de effect you gave to it! wow. i never thought that it would be so detailed! from that small scan you've made a beautiful wall! im amazed in how you made the hair and especially the roses! when i look at it i cant say anything. All I can say is "wow" to your vector! Very neat and gorgeous ^_~! I've probably said this on AP but *cough cough* Poor Yoru-chan's hands must be dead by now *stares at all the details* hahaha...The details HAVE to be seen in full view to appreciate. And like I said in AP, hair seems a bit too stiff and no variation of thickness to hair strands =S but that image you used was SMALL! I'm impressed! Details of colouring for example the roses are great! The combination of black and white really goes with the title: Icy Queen. Maybe the lips can have less angles? Very nice picture though!